Zodiacal Light via WikipediaLast Tuesday night we had the Tellers and the Zamchecks under the stars and enjoyed some unique observing experiences. As I was showing them the Milky Way one of them (it was Michael Teller who deserves full credit for this observation) pointed to the horizon and asked, "What's that?" "That", as it turns out was the Zodiacal Light, a phenomenon I had never seen before. 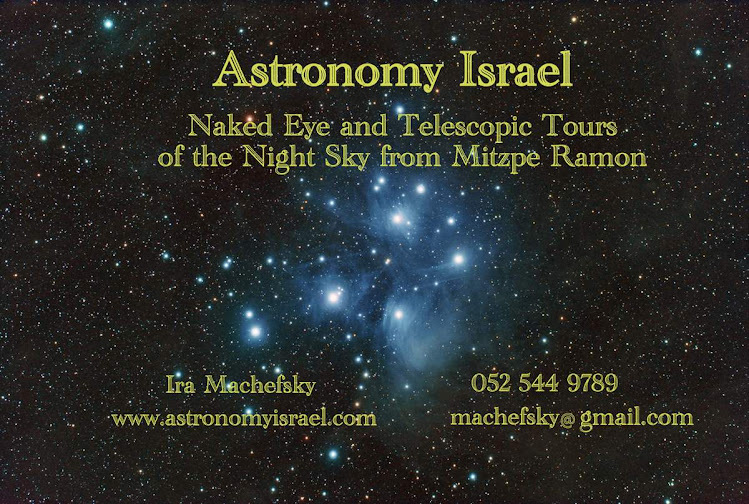 I remembered talking to one of the astronomy graduate students at the Wise Observatory in November, and he remarked that he had seen the Zodiacal Light for the first time from Mitzpe Ramon that month. The Zodiacal Light is a fan of light that rises from the horizon toward the sky following the path of the Zodiac, or ecliptic, and is caused by the reflection of sunlight from dust and debris in the plane of the solar system. It takes a very dark, clear sky and unobstructed horizon to see it, together with circumstances of the position of the sun and ecliptic that I won't go into here. It was awe inspiring to see the band of the winter Milky Way, our galaxy, overhead with the band of the Zodiacal Light, our solar system next to it, and us standing on earth in between, our place in the cosmos clearly seen. This alone would have sufficed to make for a red letter night. 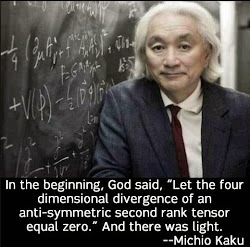 But wait - it gets better. Jupiter is a favorite telescope object right now, high overhead on an early winter's night. For the third time this year Jupiter appears quite close to Uranus as seen from the earth, just 1/2 a degree or the width of the full moon distant, and visible in the same low power telescopic field. (Although the positions of the two planets appear close in the sky as viewed from the earth, this is just an optical alignment. In reality the two planets are 15.21 astronomical units apart, or 1,414,530,000 miles. Yes, over 1.4 billion miles.) 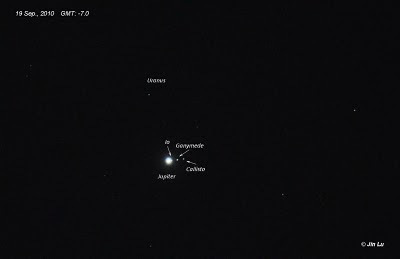 It was a wonderment to see the dark-striped disk of creamy Jupiter with three of its Galilean moons alongside, while just above it and to the side rode aquamarine Uranus like a small bubble in the black sky. I will never forget this beautiful sight, and almost refused to surrender my place at the telescope to our guests. 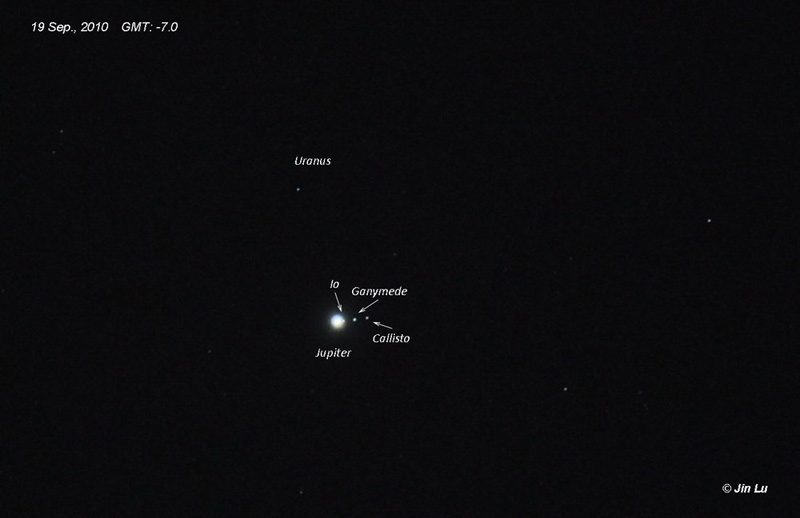 This photo, taken in September during an earlier conjunction, is a good approximation of the view in our telescope of Jupiter, its Galilean moons and Uranus on Tuesday night. Our colors were more intense. (Photo credit: Jin Lu) Click for full size image. The sights made everyone giddy with excitement, so when I mentioned that Saturn would be rising about 12:30 AM, we decided to reconvene the group then and go up for another look. This was also my first view of Saturn for this season. It did not disappoint. Not only were the rings magnificent but we could also see Titan, Saturn's largest moon, and possibly a few other smaller ones. As the last quarter moon rose in the sky with Saturn, the moon beams stuck us and for a moment we became "lunatiks". The group broke into a spontaneous snake dance across the hard rocks of the desert. Exhausted but well satisfied with our night's observing, we returned home. Tellers, Zamchecks and that wiley old moon.